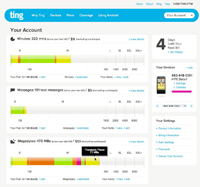 Ting, a forthcoming MVNO run by Internet domain company Tucows, is trying to put an innovative spin on the mobile experience by billing customers based upon varying usage of voice minutes, text messages and data from month to month. Click here for a closer look at Ting. The no-contract service, which is currently in a small, private "beta" test and will run on Sprint Nextel's (NYSE:S) network, aims to make the mobile billing experience simpler and more fair to customers, explained Ken Schafer, executive vice president of products at Tucows. Ting, like rival MVNO Republic Wireless, is an MVNO using Sprint's network to offer something different. Customers will have minutes, text messages and data divided into different buckets. If customers use more than they have chosen for a certain month they will not be charged an overage fee but will instead get bumped up to the next usage tier for that month. However, the kicker is that if customers use less than they had though they would need, they will be bumped down to the next lowest usage tier and will receive a credit on their bill for the difference. Users will be able to continuously monitor their usage via an online dashboard. Currently, Schafer said there are only 100 users who have signed up for accounts in Ting's beta, though 300 have registered. The beta started in October. He said Ting will add more people to the beta each week, and expects to launch commercial service sometime in the first few months of next year. Voice minutes: Between 0 and 100 minutes per month costs $3; up to 500 minutes costs $9; up to 1,000 minutes costs $18; up to 2,000 minutes costs $35; and up to 3,000 minutes costs $52. Text messages (sent and received): Between 0 and 100 messages per month costs $3; up to 1,000 costs $5; up to 2,000 costs $8; up to 4,000 costs $11; and up to 6,000 costs $14. Data: Between 0 and 100 MB costs $3 per month; up to 500 MB costs $13; up to 1 GB costs $24; up to 2 GB costs $42; and up to 3 GB costs $60. Schafer said that Ting will give users a 5 percent "grace" window on their usage before kicking customers up to the higher tier. However, he noted that if customers use anything below the bottom of tier they signed up for--499 minutes on a 1,000-minute plan, for example--they will drop down to the lower tier and get credit on their bills. "People's usage varies over time," he said. "It seems very fair. There are no penalties in any of it." He also said that users will pay less per minute, message and MB as their usage increases, which encourages users to add multiple lines of service. Another innovative aspect of the service is that customers can have multiple phones under one account, sharing pools of minutes, text message and data. Verizon Wireless (NYSE:VZ) expects to offer data plans for multiple devices sometime in 2012, Verizon Communications CEO Lowell McAdam said this week, and executives from AT&T Mobility (NYSE:T) and Sprint have hinted at such plans as well. Ting customers will have to pay $6 per device per month to keep the service active, no matter their usage. Ting will also levy a surcharge when customers use their phones abroad, for international calling and for directory assistance. The key catch is that Ting users must buy their devices upfront for the full, unsubsidized price. Currently, Tucows only supports devices running Google's (NASDAQ:GOOG) Android platform, and the beta has four devices available including the LG Optimus S for $155 and the $395 HTC Detail 4G, which can access Clearwire's (NASDAQ:CLWR) mobile WiMAX network. Schafer said he expects Ting to add more low-end and mid-range devices, as well as a high-end device, the Motorola Mobility (NYSE:MMI) Photon 4G for around $500. Schafer also said right now there no plans to support for additional operating systems--in part to keep things simple for Ting's customer service--but that might change in the future. Additionally, customers must activate their devices themselves and may need to port their numbers over to the service, which can be a cumbersome process and is something Ting is working to simplify. Schafer said Ting's customer service is another area where the company is trying to be unique. Ting will having no hold times for phone-based customer service, no separate department for retention and no "escalation" service bouncing customers from one representative to another, Schafer said. Additionally, Ting will offer customer service via online forums. Schafer declined to discuss how many customers Ting wants to sign up next year, but said he is excited about the service. He also noted that it will likely change over time, and that it's likely "the service will look and feel different a year from now, but that will be driven by what the customers want." "For us, we're really excited to get it into the market," he said. "We think we've got something that's really different. There are a lot of people that want a simple, usable service. How big that gets is something that's a very open question. We think it's going to work." Article updated Dec. 9 to clarify Ting's usage tiers.